Will you stand with Jesus? Rosalinda, a mother of three children–16, 14, and 7, all born in the U.S.–is a public witness to the inhumane treatment of her husband and their family by our failed and unjust immigration policies and practices. Rosalinda and her husband migrated to the U.S. many years ago, started a family, and lived blessed lives as hard-working, deeply-committed, and faithful Christians. And then one day, her husband was detained through a routine traffic stop, turned over to Immigration and Customs Enforcement (ICE), and deported. 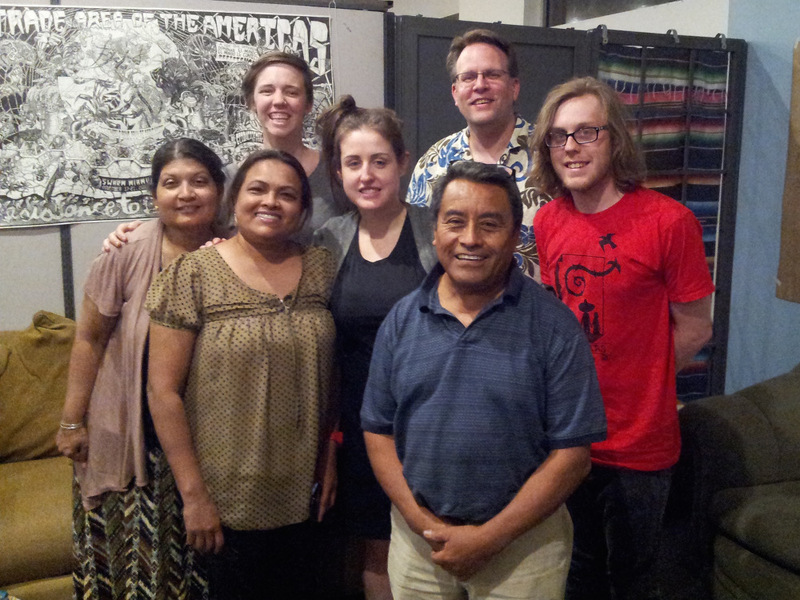 The six of us with Guatemalan human rights champion, Sebastian Quinac. 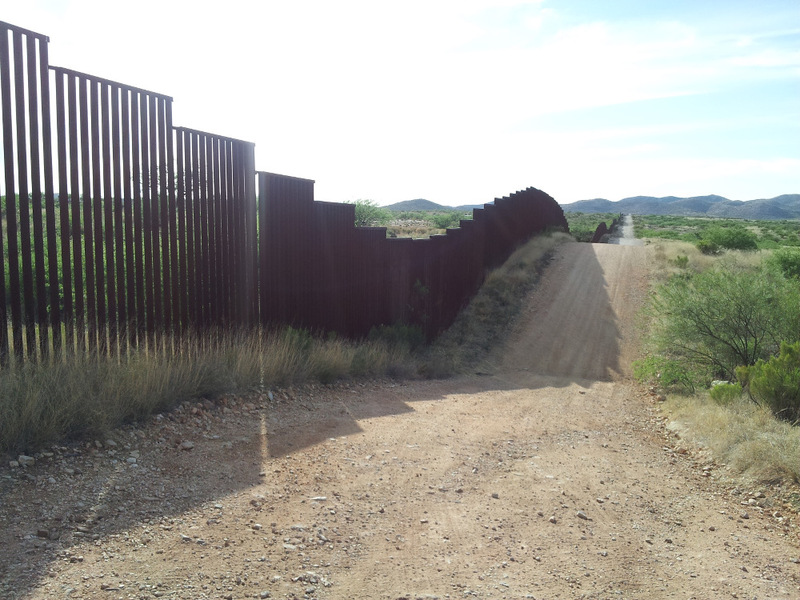 During the first week of April six people from Northern Illinois visited the border region of southern Arizona and northern Sonora through BorderLinks in Tucson and met Rosalinda and others living with similar circumstances. 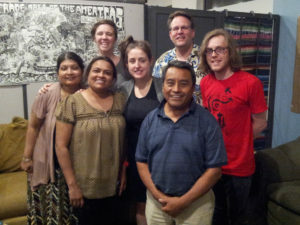 The six people were Jenny Ansay (Supervisory Attorney, Northern Illinois Justice for Our Neighbors), Nadia Kanhai (member, Grace UMC, Naperville; NIJFON volunteer), Sean Crews (deacon candidate, Garrett), Taylor Gould, (elder candidate, Garrett), Rev. Alka Lyall (Broadway UMC; founding NIJFON board member), and Rev. Chris Walters (Plainfield UMC; NIJFON board member). 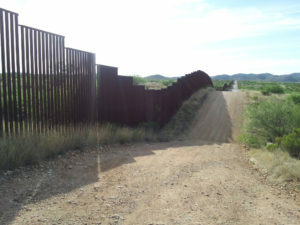 We witnessed the sheer magnitude of the inhumanity imposed by the border wall and the bureaucratic systems of arrest, detention (largely for-profit), criminalization, incarceration, and deportation of wives, husbands, sisters, brothers, and even children, who have only committed the “crime” of crossing the border. Monday through Thursday, each day, each week, 30-75 people are brought into federal criminal court in downtown Tucson and charged with a misdemeanor and a felony for “illegal reentry.” If they plead guilty to the misdemeanor, the government will dismiss the felony charge, which is punishable by two years in federal prison (and up to 20 years). Under the misdemeanor plea they are incarcerated for 30-180 days and then turned over to ICE for deportation, where they can languish for an indeterminate time after serving their “criminal” sentence. This all happens before the migrants can make their immigration claims, such as for asylum. We witnessed 42 shackled men and six shackled women go through this process in court. They could barely walk the chains were so heavy and constraining. But we also witnessed the natural beauty of the desert region and the fierce determination and love of many people we met who are working for justice and are standing up for themselves and others in the face of injustice. If you were Rosalinda’s husband, what would you do? You would, of course, come back to your home in the U.S. to be reunited with your spouse and your children. However, as in the case of Rosalinda’s husband, you may be detained indefinitely and deported again. Rosalinda is standing up. Her husband Jesus is standing up. Will you stand with her, Jesus, and their children? To learn more and request a presentation, please contact Susan Yanun.